Ethan King and tributes by the scene of the incident. The heartbroken father of a teenager killed in a horrific car crash on Sunday has thanked people for their overwhelming messages of support. Gary King, whose son Ethan died following the one-vehicle accident on the Standing Stane Road near Kirkcaldy, said the love shown for the youngster in the wake of the tragedy was “nothing short of unbelievable”. Ethan, 17, was travelling in the front passenger seat of a black Vauxhall Corsa when it left the road close to Wellsgreen driving range at 8.40am. His friend Connor Aird, also 17, is still fighting for his life in hospital after suffering significant injuries, while 18-year-old Danny Stevens is said to be in a stable condition. All three were former pupils of Kirkcaldy High School. Another 17-year-old boy who had been driving also sustained serious injuries and has been arrested on suspicion of drink driving. Mr King said the hundreds of messages from Ethan’s friends and even complete strangers had kept him going in the days since his death. Mr King described the talented young footballer as “a special young man who has had an impact on so many people’s lives” and said he was loved by many. As a GoFundMe page set up by devastated friends to help pay funeral costs hit almost £8,000 on Tuesday, Hearts FC starlet Anthony McDonald, who is also from Kirkcaldy, announced he was auctioning off football tops in aid of the family. 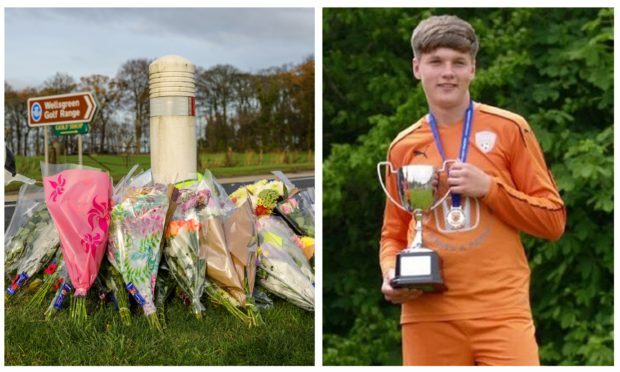 Tributes have also been paid by Raith Rovers FC, who said their thoughts and prayers were with the youngster’s friends and family and with everyone connected with Glenrothes Athletic, where Ethan was a player. Flowers and balloons continued to be laid at the site of the crash on Tuesday and Wellsgreen Golf Range urged anyone leaving tributes to use their car park rather than risk another accident by stopping on the busy road. Police have urged anyone with information about Sunday’s crash to contact them on 101, quoting incident 1257 of November 11.